Das Kapitel wird sich zu 75% um Rebecca's Vergangenheit drehen. Wir sehen Ihre Mutter sterben und die "Beziehung" zwischen ihr und dem Spielzeugsoldat. Rebecca cries the toy soldier will surely die. She explains to Luffy that they are no different than humans, they become friends to friendless, brothers to brotherless, and lovers to the loveless. Ever since she lost her only family, her mother, the soldier has been with her, he's like a parent to her. Luffy scoops up the food he dropped to eat, while Rebecca looks at him speechless. He tells her she doesn't look like a prisoner, and she tells him they'll meet again at the championship finals. Rebecca lives with her mother, who gather flowers and sells them. Meanwhile in Dressrosa, apparently the king has gone mad and set fire on a village. Group of rebels attack Rebecca ad her mother, as a citizen cries out to Scarlet, the mother, to run. The man leading the chase seems to be young Diamante. Scarlet and Rebecca are on the run, but they are starved from not eating for two days in a row..
Scarlet goes back to the town to buy food for her daughter, but is killed in the process. The toy soldier comes running back to Rebecca, carrying the corpse of her mother. and they're looking to capture anyone related to the old king, including her mother. He vows to always be by her side, and to protect her even if costs him his life. Rebecca rejects him, and runs away crying, blaming the soldier for not being able to protect Scarlet. 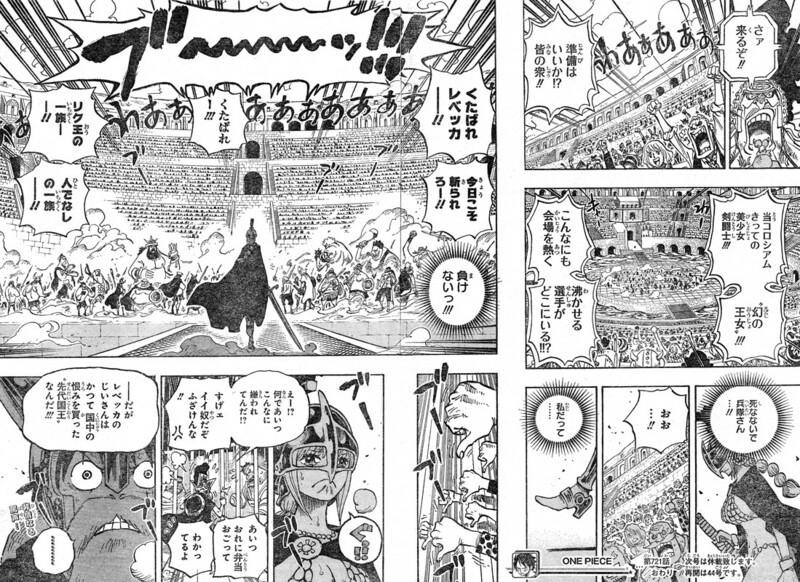 Meanwhile in Dressrosa, Doflamingo takes the throne, blaming the former king for turning on his people. He promises the citizens of wealth. As the toy soldier and Rebecca spends time together, she develops affections for him, and opens up to him. He finds a home for Rebecca to stay in as he work for her living. He cannot enter the house, so he tells her he'll leave a petal of flower through the window every morning to remind her he's always near by. Some days pass, and Rebecca gradually grows up. The soldier acts as a guardian, fending off bullies from her as well as boys who wants to date her. But one day, group of thieves enter the house thinking there's only a little girl living there alone. As the thugs tie up Rebecca, the toy soldier comes rushing in, shooting them with guns. The soldier is now a wanted man, and Rebecca leaves the house with him. As they travel together, the soldier teaches her how to fight. How to keep herself from any harm. As block D starts and Rebecca enters the ring, the crowd boos at the sight of her. Because she is a linage of the Riku Royal family, she is hated by the whole island. hearing this Luffy snaps and enrages at the crowd. Heftig, das scheint ein sehr interessantes und informatives Kapitel zu werden. Da bekommt man ja richtig Hass auf Dofla, Diamante scheint ja ebenfalls ein übler Bursche zu sein. Aber die Jungs werden von der SHB noch richtig aufgerieben, da freue ich mich schon richtig drauf. Das wird ein sehr interessantes Kapitel, ich freu mich schon drauf. Wie erwartet gibt es den Flashback, der die ersten Szenen von damals zur Zeit der Machtübernahme zeigt. Aber was geht bei Caribou. In Scotch eindringen und ihn dann von innen aufplatzen lassen?! Passt zu ihm. Jedenfalls übernimmt seine Truppe wohl die Überhand und es wird das Happy End geben. Na wenn da mal nicht wer seine Fingerchen im Spiel hatte. Also hat sie auch eine tragische Vergangenheit erlebt, musste hungern und ihre Mutter ist aufgebrochen um was zu essen zu holen, doch kam sie dabei um. Aber dann stand vor ihr der treuer Soldat, der sie vor jeden und alles beschützt. 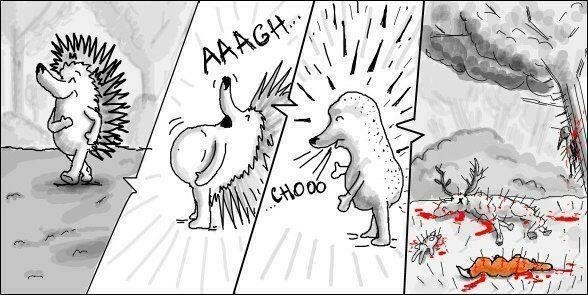 Auch vor stinknormalen Jungs. Na, wer hat schon Vatergefühl für eine Tochter;)? Ich wette darauf, nachdem ich es im letzen Kapitel schon ansatzweise Vermutet habe, dass dieser Soldat ihr Vater ist. Auch interessant, dass er schon vor der Übernahme von Flamingo als Soldat lebte. Zudem wird sie bei mir Block D gewinnen. Sie scheint stark zu sein und alles andere erscheint aus Story technischer Sicht langweilig zu sein. Man stell sich vor: Rebecca vs. einer der Flamingo Familie. Da sind Emotionen im Kampf. Und bei Ruffys Gesichtsausdruck, wird er dann einschreiten, wenn Rebecca am verlieren ist. Auch interessant: Vom Adel wird sie verachtet, von den Gefangenen wird sie geliebt. Aufjedenfall ist Flamingo ein richtiges Arschloch, was ihn aber durch sein intelligentes Vorgehen, irgendwie sympathischer Macht^^. Ich freu mich schon aufs Kapitel, wird sehr interessant. Danke Solariumigel. Habe ich doch glatt übersehen. Dass heißt all die Arbeit umsonst^^. Naja egal.